Gor Mahia have been nominated for the annual sports team of the year award by virtue of having won the 2014 Kenya Premier League. The other teams that have been nominated are league runners-up Sofapaka who are also the GOTV Cup winners, two rugby teams in Kenya 15’s and KCB the circuit winners and Kanbis Cricket club. The Kenya rugby 15s side was the bright spot in rugby this year. While their sevens counterparts were faltering, the 15s side came close to qualifying for the world cup but fell short at the last moment. Sofapaka did really well to finish second in the league, three points behind Gor Mahia and ended up winning the GoTv shield. To make matters worse, head coach Bobby Williamson departed mid season to pursue a coaching job with Harambee stars. A mass departure like that one would have crippled most teams. Not to mention that the players had to adapt to a new coach in the middle of the season. But the steely determination of the players carried them through. The unending fan support was also a crucial factor in lifting the determine. There was a three horse race at the end pitting Gor Mahia against Tusker and Sofapaka. In the end Gor Mahia overcame the odds carried the day to lift the trophy for the second succesive season. Over the next two weeks the public will have a chance to vote for their Sports Personality of the year (male and female) and the Sports Team of the Year (male and female) through the Short Message service, SMS platform for free. To vote for their chosen athlete and team, one will have to dial *279# from their Safaricom line and follow instructions untl a week before the awards. The Safaricom Soya Awards will be held on January 16, 2015 at the KICC, Nairobi. League matches rarely come with such heightened importance as the one this Sunday between defending champions Gor Mahia and Sofapaka. These are the two teams at the top of the league and are seperated by only four points with three matches left. The KPL has inexplicably awarded Tusker all three points in their disputed match against Muhoroni. While the decision is shocking, it is not surprising when coming from Jack Oguda and KPL. Last year he SoNy caused the abandonment of their match against Gor Mahia yet instead of immediately awarding Gor Mahia the match, he dilly dallied and waited. He even went as far as disregarding a FKF directive. It was only after Gor Mahia had basically won the league that he eventually decided to award the match to Gor Mahia. And earlier this year, Tusker escaped sanctions after their players and officials accosted and manhandled a referee. With Tusker now back in the hunt, all three teams have a mathematical chance of winning the title. 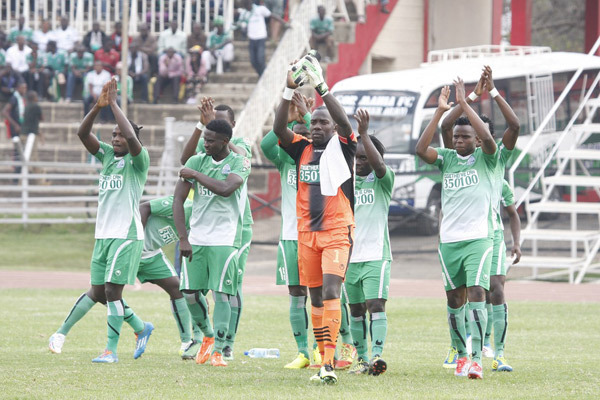 A win for Gor Mahia will knock Sofapaka out of contention. But Tusker will still be in contention whereas Gor Mahia will now need only a point from their last two matches. A draw will benefit Tusker as it will leave them with a chance to move level with Sofapaka and within four points of Gor Mahia. And of course a loss for Gor Mahia will complicate matters as all teams could now move within three points of each other. Gor Mahia must therefore be hyper-focused and vigilant as they have been over the past few matches. Aside from the match against Tusker, Gor Mahia have been rock solid. And they will need to be even more solid against Sofapaka who are in good form. They have recently beaten KRA 3-2 before recording an impressive 2-0 win over AFC Leopards. Last season Gor Mahia met Sofapaka in a crucial league encounter at the end of the season. On that occasion it was Dan Sserunkuma who sunk Sofapaka with a well taken goal following a flick from Patrick Oboya. Indeed Gor Mahia has had the upper hand over Sofapaka in recent matches. 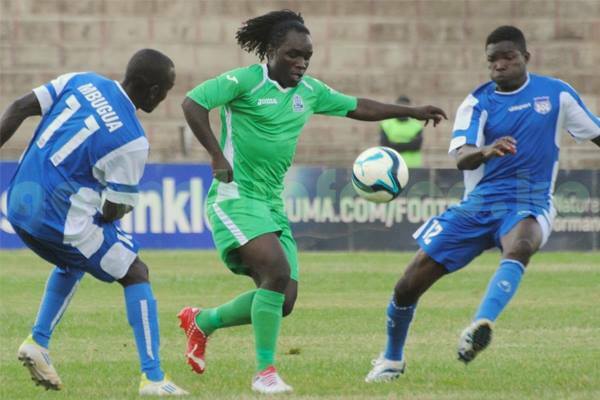 During the first leg match of 2013, Gor Mahia won 1-0 thanks to a well taken goal by Kiongera following a superb run by Lavatsa on the left flank. And in May of this season, Gor Mahia beat Sofapaka 2-1 with goals by Sserunkuma and Rama Salim who had a whale of a game, giving the Sofapaka defence nightmares. 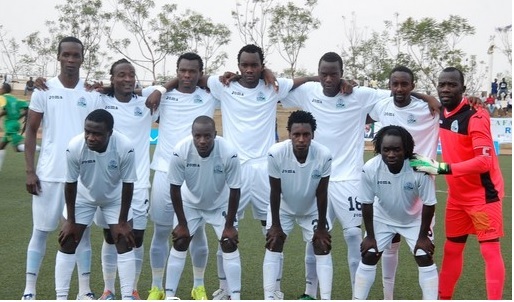 “Sofapaka are a good side who are also keen on winning the KPL title. We expect a tough match against them on Sunday and for this reason, we must all be at our best. It will not be an easy match and we need to maintain our focus all through. 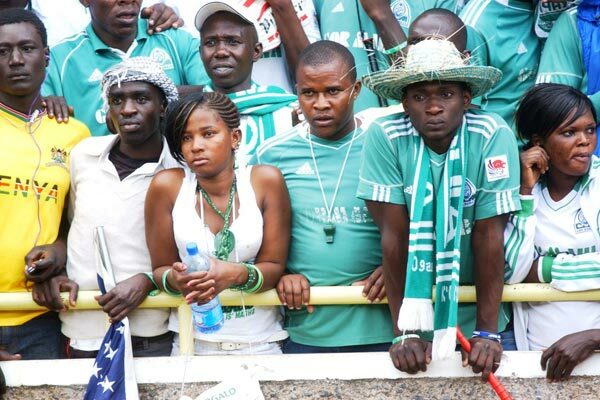 The 12th man has carried Gor Mahia on several occasions. They must show up in large numbers for this match that is tentatively scheduled for Machakos. They must lift the team but remain peaceful while keeping in mind the harsh sanctions that have been levied against AFC Leopards. Fans remember that whatever happens on Sunday, Gor Mahia will still be leading the league with two matches left. So get behind the team but remain peaceful. Dan Sserunkuma has been the most consistent scorer in the Kenya premier league over the past in 2012, he almost nailed the scoring title but missed by finishing only one goal behind John Baraza. In 2013, he spent much of the first leg on the bench as coach Logarusic preferred Mungai Kiongera and Rama Salim upfront. But he came on strong in the second leg, scoring 8 goals. In 2011, he had six goals, which was four behind Hugo Nzangu who was the leading scorer. Gor Mahia rarely produces the league’s leading scorer. In fact one might have to go back to the 1990s or even the 1980s to find the last time a Gor Mahia players was the top scorer. In the intervening period, other players like George Odhiambo, Emmanuel Wakata, Steve Okumu and Tom Odhiambo have been among the leading goal scorers. This season however, Sserunkuma has topped the scoring charts for most of the season and seems destined to capture the scoring crown. With three matches left, Sserunkuma is in the drivers seat with 15 goals. Stepehen Waruru of Ulinzi is breathing down his neck with 11 goals. But he is nonplussed and insists that winning the league is far more important. “It is great to be the leading scorer but for me the most important thing is helping Gor Mahia win the title. Two years ago, I scored many goals but it did not give us the title,” he told the Standard. And he is under no illusions but how difficult the match against Sofapaka will be. 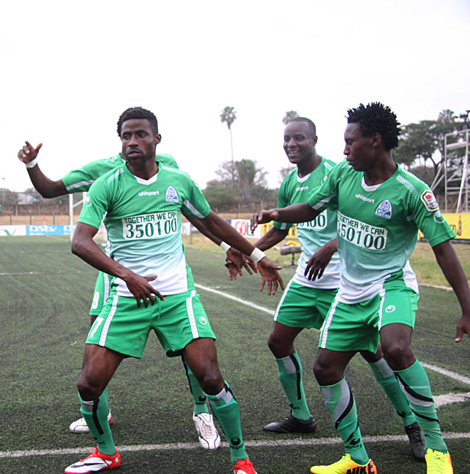 When Gor Mahia last played Bandari in Mombasa on March 30, Bandari shockingly won 2-1. Aside from the loss to Top Fry Nakuru, this is probably the most unexpected defeat Gor Mahia has suffered this season. It cannot be gainsaid therefore that Gor Mahia will be gunning for a measure of revenge When they play Bandari at City stadium on Wednesday. Even more important however, Gor Mahia will be hoping to pick up where they left off against Chemelil on Saturday. It was an all round brilliant performance from all the players; Skipper Jerim Onyango is in peak form, making incredible save after incredible save, Geoffrey Walusimbi is thriving in his new role as playmaker, while Kizito and Gattuso are as solid as ever. As for Sserunkuma, his goal-scoring touch has incredibly not escaped him since he joined the club in 2011. Yet again he leads the scoring charts.This kind of goal scoring consistency has not been seen since Hezborn Omollo in the mid 1980s and Ouma “Chege” in the early 1970s. David Owino “Calabar” has yet to have a bad league game since Logarusic gave him a spot in the starting line-up. Talk about consistency. And of course, Gor Mahia fans were elated to see George Odhiambo “Blackberry” recover his mystical touch from 4 years ago. Some strikers have a fragile psyche and it takes a certain type of coach to coax the confidence back to the surface. Perhaps thats what Nuttall has done with Blackberry. Fans will be hoping that he continues on Wednesday. But Bandari who are under the chairmanship of former Gor Mahia winger Ben Oloo “Breakdance” will be in a fighting mood. They are literally fighting for survival, being only 6 points above the relegation zone. Their last four games have ended in draws, including an impressive draw against Sofapaka. Of note, Gor Mahia will probably be playing against midfielder Shaban Kenga who donned the Kogalo jersey while on loan during the first half of thsi year. But coach Twahir Muhidin has so far been unimpressed with Kenga since his return. “He is not just the same player we had before he went to Gor Mahia. Something has changed about him and I have challenged him to work harder and give more”. Remember Kenga had expressed a desire to stay at Gor Mahia but he was forced back by Bandari. Skipper Jerim Onyango for his part has underscored the importance of concentration as the league enters its final lap. And when it comes to concentration and focus, Jerry “Jagoal” has been leading by example over the past four games. He has been solid between the posts. A win for Gor Mahia will put them 4 points clear of closest challengers Sofapaka. But coach Frank Nuttall acknowledges that there is still a long way to go. “It’s difficult to tell if we will win the league because it’s getting intense every time but so long as we are on the go and take each game as it comes we will win it,” the Scotsman said. The match kicks off on Wednesday at 4pm at City stadium. Gor Mahia opened up a four point lead at the top of Kenyan Premier League table after edging out Chemelil Sugar 2-0 at City Stadium on Saturday. A double from Ugandan striker Dan Sserunkuma pushed K’ogalo’s points to 47, four adrift second placed Tusker, who were held to a 1-1 draw by Nairobi City Stars on Friday. It was first victory for new coach Frank Nuttall, who replaced Bobby Williamson, and the Briton is now confidence that they have what it takes to retain league crown. “This was a comprehensive victory against a very determined side. We were on top from onset and I thank God now that I have won my first match in charge of the team. Chemelil coach Mike Mururi conceded defeat but refused to rule out his side for a maiden league title this season. “We lost to a well organized side but that does not mean that we are out of the race. Seven or six matches to go means the league is far away from being decided. The sugar millers will remain fourth after defeat to Gor Mahia on 41 points, six points adrift the league leaders and champions. Gor Mahia were the better side from onset as Sserunkuma and George ‘Blackberry’ Odhiambo caused all sorts of problems for Chemelil’s back four. Sserunkuma went close in opening minutes but was denied after combining well with Odhiambo. Chemelil also had their moment of brilliance with a lovely free-kick by Murage forcing a tip save from keeper Jerim Onyango. Onyango had to produce his best to block another shot three minute later. K’Ogalo went ahead minutes later as Sserunkuma jumped to head home from an unmarked position. Gor Mahia led 1-0 at half-time break and looked a more rejuvenated side in second half with Sserunkuma and Odhiambo leading the attacks. Sserunkuma completed his brace in 56th minute, racing to tap home a cross from Odhiambo, who enjoyed a good afternoon. Erick Ochieng was presented with best opportunity to make it 3-0 by a pin-point cross from Patrick Oboya but his shot was too feeble to allow the keeper collect the ball. The 2014 Tusker Premier league is destined for one of the most heart stopping finishes in its history. The four teams at the top are separated by only two points. Gor Mahia had a chance to put some space between them and the closest challengers but two succesive draws have complicated the situation at the top. Still Gor Mahia has a chance to go top when they take on Ulinzi on Wednesday. They will have only 3 days to correct some of the errors they made against Tusker on Sunday. According to assistant coach Bobby Ogolla, the defense gave Collins Kimani too much space. “We had victory snatched from our grip by a lapse in defence. Our defenders allowed Kevin Kimani too much space on the left and he destroyed us with that killer pass to Clifford Alwanga,” he told goal.com. Both Bobby Legend and new coach Frank Nuttall have their work cut out to fix the issues. Bobby thinks Gor Mahia played well and are still in the driving seat. If the defenders played below average, then one player who played well above average is captain Jerim Onyango who was rock solid between the sticks. Ulinzi are surprisngly even with Gor Mahia in their all time record over the past few years. In April of this year, Gor Mahia beat them 1-0. In 2013, Ulinzi won the first leg while the second leg ended 0-0. A win for Gor Mahia will see them go to 46 points and atop the premier league. A draw will complicate things further and pull them further into the crowded leading pack. New coach Frank Nuttall has yet to win a match since he joined and Wednesday would be a good time to get his first win. Many have blamed a lack of player depth. One person who thinks Gor Mahia’s playing unit is fine is former AFC Leopards and Harambee stars goalkeeper John Busolo. “Only Tusker can prevent Gor Mahia from winning the trophy for a second time in a row. The KPL champions have everything they need to defend the title; Young players and passionate fans.” said Busolo. He also thinks there are plenty of positives to pick from their recent CECAFA cup campaign. Busolo had an illustrious career and was Kenya’s goalkeeper at the 1992 Africa Nations cup. More recently he was the goalkeeper trainer at AFC Leopards. The match against Ulinzi will kickoff at 4pm on Wednesday at City stadium. May the 12th man turn out in large numbers. Gor Mahia will have to shore up their defence. But they will have to do it without dependable defender, David Owino “Calabar”. Owino was booked on Sunday and Secretary General Chris Omondi has indicated that having accumulated 5 yellow cards, Calabar is required to miss one game. In his absence, Gor Mahia might count on new signing Charles Bruno. Gor Mahia are set to name a coach to replace Bobby Williamson on Tuesday August 26. This according to a report by the Standard newspaper. Coach Bobby Williamson has indicated that he has given his suggestion as to whom should take over as coach. “I have talked to the chairman (Ambrose Rachier) and recommended someone for the job. It is someone who is a qualified coach and one who can lift up this club to greater heights,” he said to the Standard. And in a separate report, Williamson heaped praise on his long time assistant and club legend Bobby Ogolla, thus hinting at whom his personal favourite would be. “Ogolla has done a wonderful job and will be a good replacement,” he said. From a continuity perspective, Ogolla would be good. But it remains to be seen whether his health can withstand the pressures of being Kogalo coach. Club Chairman Ambrose Rachier is said to prefer Zedekiah Otieno. But Otieno is unlikely to leave SoNy Sugar mid season. Former coach Zdvarko Logarusic would be a fan favourite but given his past history of agitating for higher pay and the financial status of the club, he is an unlikely choice. With Gor Mahia having regained their position atop the Tusker premier league, it will be critical that a suitable replacement is found who can enable the club to maintain its position starting this Thursday against KCB who are determined to fend off relegation. Meanwhile Williamson has officially taken over as Harambee stars coach and has named four Gor Mahia players in the squad to play Egypt. New sensation Timothy Otieno is likely to make his full debut. Other Kogalo players named are David Owino, Jerim Onyango and Anthony Akumu who is out on loan. Bernard Odhiambo, a younger brother to David Owini has been named. Gor Mahia returned to domestic action with a 1 – 0 win over SoNy Sugar in the two teams’ Kenyan Premier League (KPL) match played at the Nairobi City Stadium on Sunday 24 August, a win that was heavily aided by the visitors’ keeper Lucas Indeche’s 57th minute mistake. Timothy Otieno got the first sight on goal for the KPL champions on the fifth minute when he robbed Alfred Onyango of the ball but he took too long to make a decision and his eventual option of passing to his strike partner Dan Sserunkuma came late and Onyango recovered to clear. Action was stuck in the visitors’ goal area and Indeche was called upon on 16 minutes to smother George Odhiambo’s free kick after he was fouled by Andrew Anthony 20 yards out and four minutes later Harun Shakava’s header from Kennedy Ayong’s corner flew wide. Gor Mahia skipper Jerim Onyango pulled a great save on 22 minutes when in a one on one situation with Edwin Oduor – the striker shot well but Jerim just took a timely touch and Harun Shakava raced in to clear the danger. Five minutes to the break, Timothy Otieno had another good chance after getting to the end of George Odhiambo’s cross but he blasted wide when he just had Indeche to beat and just before half time Eric Ochieng fed Sserunkuma in the box but Indeche made a decent save. The ensuing surge forward saw Andrew Anthony well poised and he managed to beat Jerim Onyango as the Gor Mahia defence went missing but the SoNy Sugar man’s touch was too heavy and the ball sailed clear of any danger. Indeche’s moment of madness came on 56 minutes when he handled the ball, placed it down and picked it again to give away a free kick in the box and Geoffrey Kizito stepped forward to steer the ball home for the only goal of the game. Gor Mahia had the chance to double the advantage after Kizito picked out Sserunkuma with a great pass on the 74th minute but the league’s top scorer, faced with just Indeche, went for power and lacked precision and his attempt flew high. The result saw Gor Mahia reclaim top spot with two matches in hand and with 41 points while SoNy Sugar stays rooted in ninth place with 28 points after 22 matches. SoNy Sugar: Indeche Lucas (GK), Wycliffe Nyangechi, Omweri Joseph, Onyango Alfred, Odette Charles, Asembeka Amos, Andrew Anthony(80’ Robert Ouma), Oduor Kennedy, Oduor Edwin (72’ Kennedy Otieno), Chamberi Marwa (c), Mwangi Joseph (58’ Samuel Onyango). 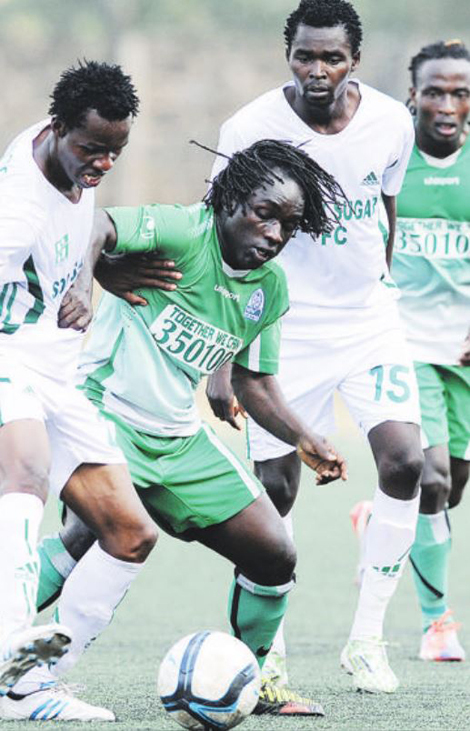 Gor Mahia return to league action this Sunday as they take on SoNy Sugar of Awendo on Sunday at the City stadium. All week long Gor Mahia players have been saying how much they learned from their CECAFA experience. “We returned from Rwanda with vital lessons, and the whole team is focused on retaining the title,” Williamson added. Fans will be hoping that they can put those lessons into action. Indeed fans will be looking for something to cheer after a period of bad news. SoNy coach Zedekiah Otieno “Zico” has nnaounced that his team is determined to secure all three points despite missing key players Sylvester Wanyama and Victor Ademba. “We have prepared very well. It is just unfortunate that we will be missing some players but we are well motivated especially after the KPL disciplinary committee listened to our appeal. I believe the boys will measure up,” Otieno, a former Gor coach, told Saturday the Nation. As Gor Mahia embark on finding a coach to replace the departing Bobby Williamson, it has emerged that Williamson will be assisting the club in finding his replacement. According to futaa.com the team will be searching for a coach who will neither interrupt with his style of play nor conduct with the player unit and one that understands his philosophy well, possibly a man he has closely worked with previously. Among the names mentioned before this former Harambee stars coach Jacob Ghost Mulee who was recently fired by FKF. Then there is former club coach and player Sammy Omollo “Pamzo”. Gor Mahia regained lead at the top of Kenyan Premier League after two second half goals downed Western Stima 2-0 at Afraha Stadium in Nakuru on Saturday. The win increases Gor Mahia’s points tally to 34 on the log which is three better than second placed Tusker who lost 1-0 to Sony Sugar in Awendo. It is a result that left Gor Mahia coach Bobby Williamson optimistic about team’s title hopes in a season that has seen his side lose key players and a shirt sponsor. “This was a very important win for us and it shows that we are still strong enough to defend the title with our new players. The new comers gave a good account of themselves and the fans have something to celebrate,” Williamson told Goal. Eric Ochieng’ scored first goal for Gor Mahia in 70th minute before Timothy Otieno added the second six minutes later. Otieno was an instant hero after scoring the second goal as he had earlier in the 50th prevented a John Kariuki goal bound shot from counting. Gor Mahia were in full control at the beginning of the match and were reearded by an early free-kick from which Timothy Otieno was denied by Samuel Odhiambo in the Stima goal. In the 8th minute, Western Stima replied from a counter attack which posed a threat near Gor’s danger zone and its clearance led to Stima’s first corner-kick. Gor retaliated hard four minutes later pitting Baba kizito whose on-target stroke was deflected by the Stima custodian. The match went on with shifts of ball from Gor’s end to Stima’s end and vice-versa when Ali Bai shot met hard defending. Five minutes later, John Kiplangat had another chance to put his side ahead but missed as the game ended 0-0 at the end of first half. Urged on by the huge turn out, Gor Mahia were always going to score and indeed did so after putting their opponents under intense pressure to a point where they cracked. Subs:David Juma [GK], Patrick Onyango, Musa Mohammed, Simon Mburu, Charles Bruno.